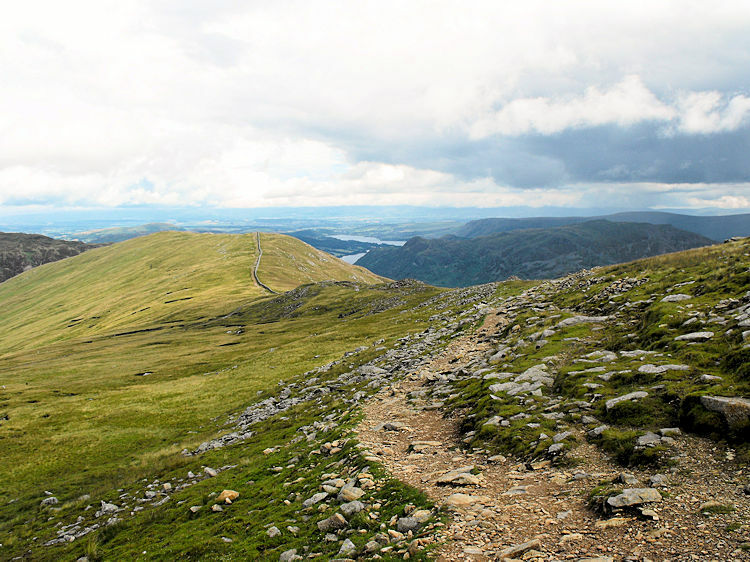 Summary: I had walked up Helvellyn via Striding Edge from Glenridding on a previous occasion. 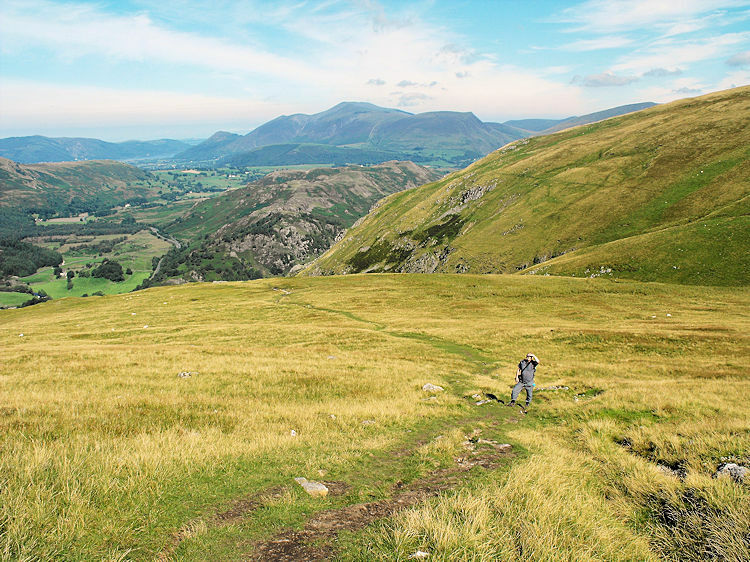 Dave and Steve had not so on a trip to the Lakes some years ago I convinced them to do it. 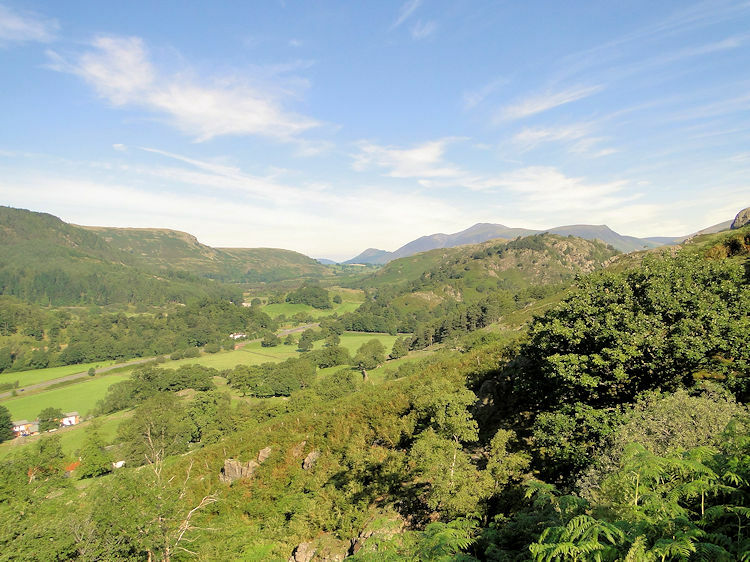 As we were staying in Keswick we did the walk from Legburthwaite via Sticks Pass and Raise. This would make Striding Edge easier as you can see what you are letting yourself in for whereas from Glenridding you do not know what you face on the exposed and narrow ridge until you are faced with it. Despite my reassurances Steve and Dave were still nervous as we set off on the walk. It was a walk with its usual diversions as they usually are when the three of us walk together. As we set off from Legburthwaite to Sticks Pass the early morning cloud had completely cleared to reveal a wonderful summers morning. It was crucial it had cleared because I would have a hell of a job getting Dave and Steve on to Striding Edge if it was anything but favourable conditions. The initial half mile of climbing to Stick's Pass from Legburnthwaite is very steep and Dave in particular made heavy weather of the start. Once he had overcome his predictable early walking lethargy though we made good progress and ascended the heights into the hills steadily. Soon Stick's Pass was in sight. Once we reached Stick's Pass the steep climbing came to an end. 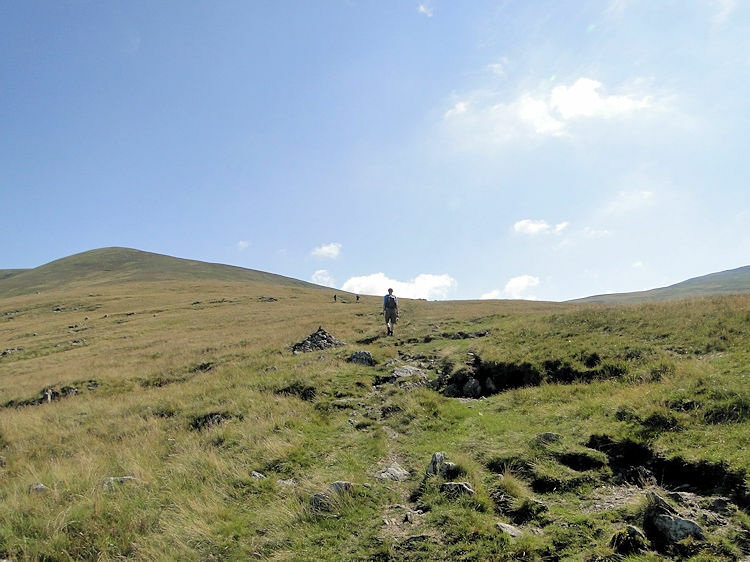 We walked on to Raise where I had enjoyed the most marvellous panoramic views on my first visit. I was not disappointed this time around, those same views I had banked in my memories were waiting for me. 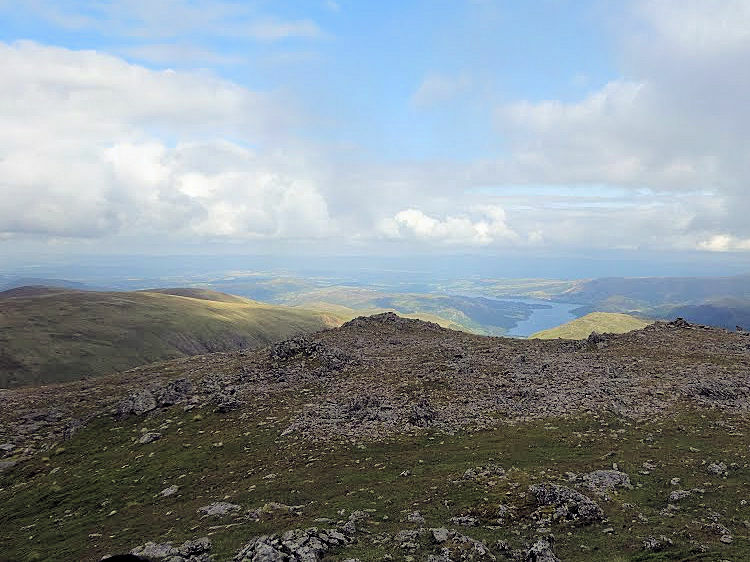 The underrated summit of Raise provides the most fantastic of views towards Ullswater, Haweswater and the entire upland landscape to the east on a clear day. From Raise we continued on to White Side and then to Lower Man. 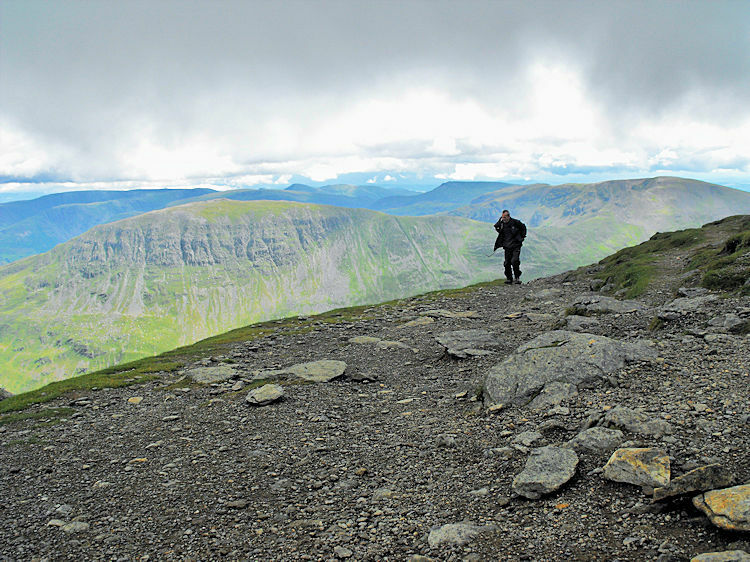 The next destination was the summit of Helvellyn from where we could take a break before taking the walk of faith to Striding Edge. 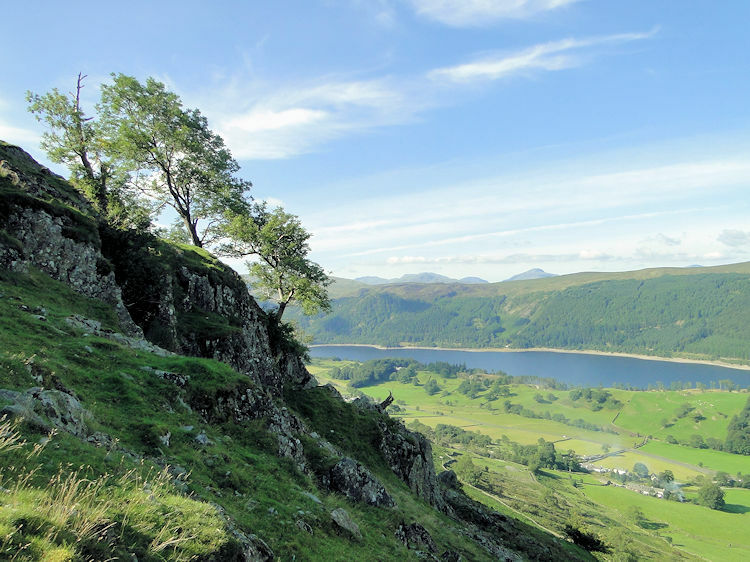 Steve was so excited at the prospect of crossing Striding Edge for the first time he felt obliged to call his wife and let her know he was prepared for the challenge. 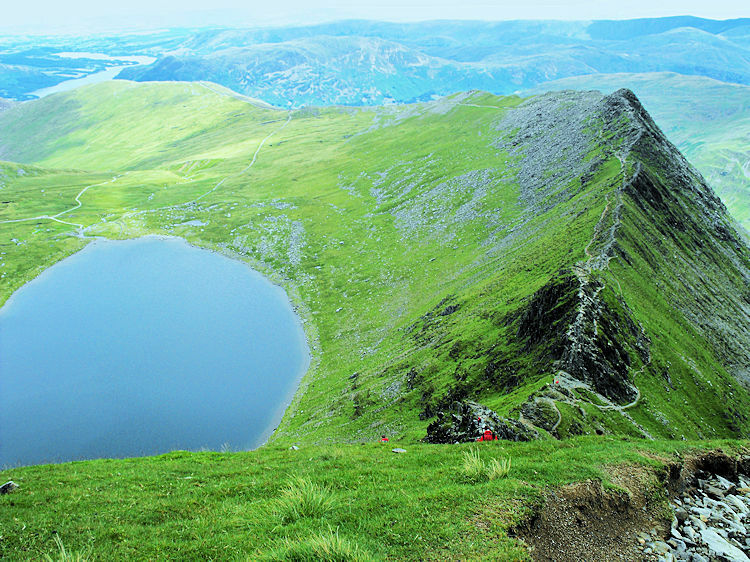 As he did so clouds whisked across the top of the mountain and momentarily shielded Striding Edge from view. I hoped it was a lonely cloud and not a harbinger of a cloud bank coming in. I was relived when the cloud had passed to reveal Striding Edge in sunlit glory. Time to press on. After a pause for breath and with a determination to succeed both Dave and Steve made their way down from the summit of Helvellyn to make their maiden crossing of Striding Edge. 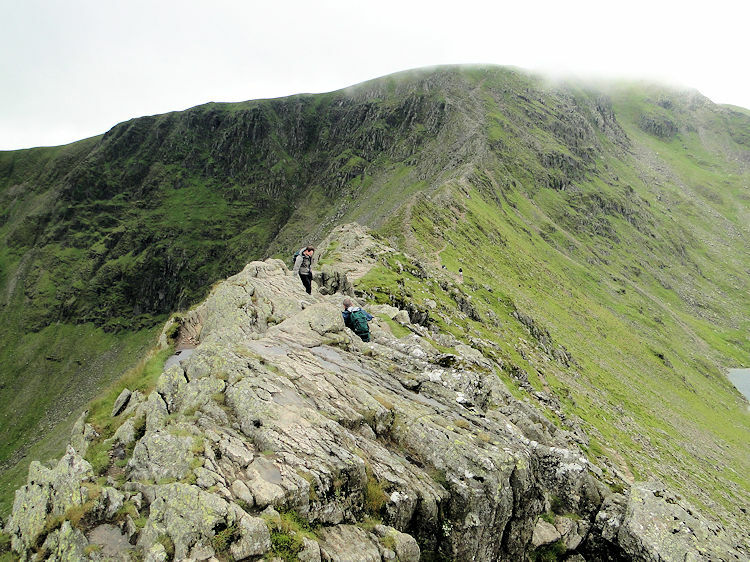 The walk along Striding Edge was fun all the way. As my two companions could see what they had to do they too found it an easy undertaking. After all the moaning I took from them during the earlier part of the day they achieved the crossing without a problem and they even shrugged their shoulders when looking back at Helvellyn to see cloud crossing the top once more by saying "so what, it is clear here". They really did enjoy the crossing and I could see the thrill in their eyes as we reached Hole in the Wall and took time out to have lunch. 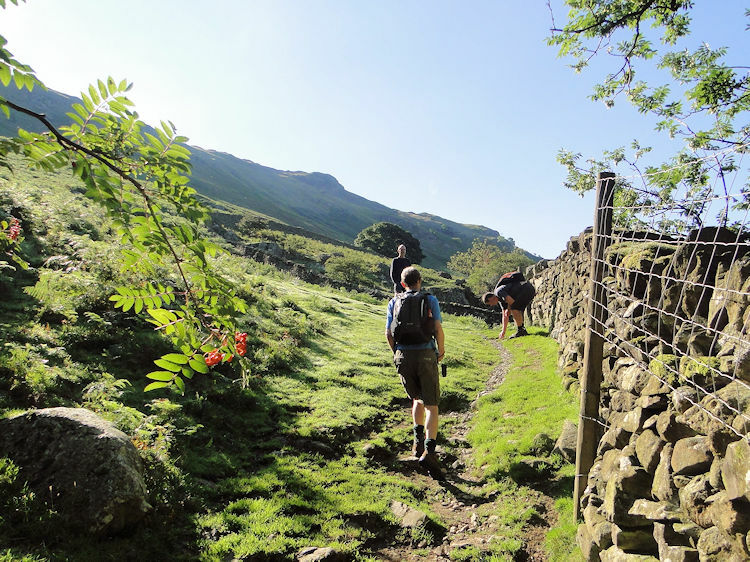 The most direct descent to Grisedale Beck from Hole in the Wall does not have a path so we followed a wall down to Patterdale Common and oh, did Dave moan. It was funny though but a tough scramble down and we were all a bit jiggered when we reached the common. Steve had reason to moan too. The scramble down to Patterdale Common has destroyed his trusty old walking boots. They fell apart during the tough descent, parts of which we all spent on our backsides. A sad moment it was for Steve losing the boots. And it still now makes me think back to all the occasions I had followed in his tracks during the hundreds of miles we had all walked together. I had often watched the soles of his boots just ahead of me. They were so distinctive with a light grey sole and a logo that always drew my attention. No more was I going to have to endure the sight of that darned logo. 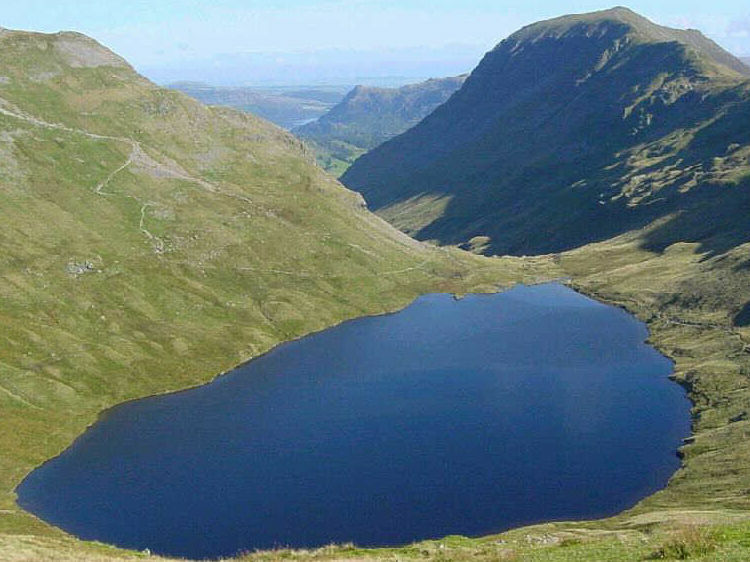 Our subsequent climb up to Grisedale Tarn was not much fun either. Realising our fatigue when we reached the tarn the six mile walk along a woodland track back to the car that we faced after the three miles we still had to do to get to Mill Bridge was ruled out unanimously. We all agreed that getting a bus at Mill Bridge was the sensible option. And so we did just that, a good choice as the heavens opened to bring a close on our wonderful walking day. A bus came shortly after we had reached the bus stop and we enjoyed one of the sweetest bus journeys ever back to the car. 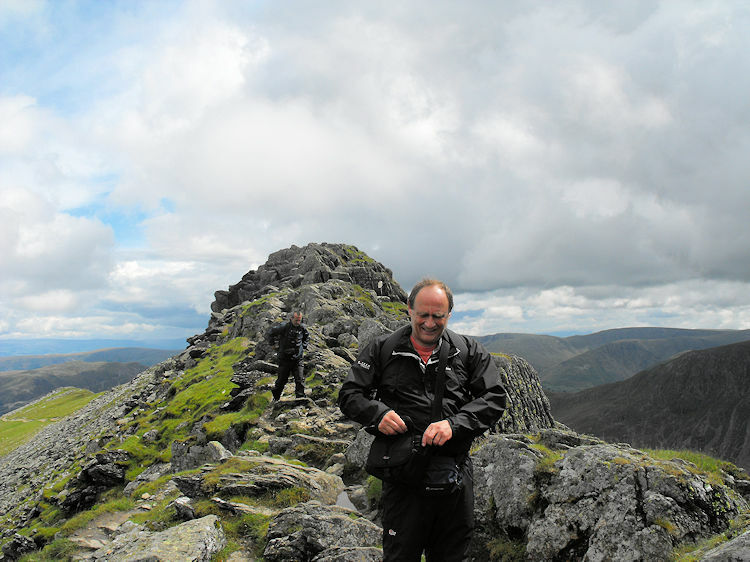 A good laugh, and now Steve and Dave can always say they have done Striding Edge. Well done boys. Oh, and goodbye to Steve's old boots.